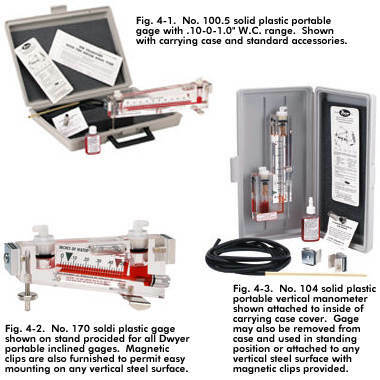 Dwyer solid plastic portable manometers are precision instruments in inclined and vertical (well-type) styles for the measurement of static pressure, vacuum or differential pressure. To assure the accuracy required in instruments of this type, all machining of bores and wells is to the highest standards of precision backed by Dwyer's years of experience in the fabrication of acrylic instruments. 1" Thick Acrylic Plastic Body is a solid block, virtually unbreakable, stable and free of the danger of distortion. Drilled bore Accurate to ±.0002" are permanently free of bends or crooks, will not require recalibration because of distortion. Selected Gage Oil with high wetability characteristics forms a consistent, well shaped meniscus for easy readability. Adjustable Reflective Chrome Finish Scales with thumbscrew locking for easy zeroing. Parallax-Free Reading for maximum accuracy and consistency is achieved by simply aligning the meniscus with its image reflected in the polished aluminum scale. Screw Type leveling Adjustment for inclined style gages provides rapid and accurate leveling with reference to integral sensitive ground glass bubble level. Furnished Complete with accessories and plastic carrying case. Plastic or Steel Carrying Case (plastic pouch for 170, 171 and 172), two magnetic mounting clips, two rapid shut-off nylon tubing connections, one 9' length rubber tubing, terminal tube and extra bottle .826 red gage oil. A-396A Calibration Pump - Use as a pressure source to calibrate gages, set switches, etc. Has volume adjuster, bleed valve and fine adjustment for pressures up to 72 psi (5 bar). Accessories include barbed fitting, tee connector, three 36 in. lengths of vinyl tubing and instructions.